What can we expect at this week’s intersection of design and technology in Las Vegas? Before a week for looking forward, a brief pause and a quick look back for context. 3 years ago, Microsoft launched this hip series of conferences, inviting a cross-platform audience of business decision makers, developers and designers (…wait… designers?!). 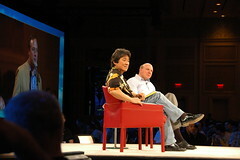 It was the only MIX keynote to star Bill Gates as Microsoft’s Chief Software Architect, and featured a fireside chat between Bill and Tim O’Reilly, and Bill’s mea culpa about the state of IE6. The conference’s sophomore year was billed as a “72-hour conversation” at a time when the rampant success of social networking was all the buzz. Ray Ozzie took the helm, WPF/E got its new look and name, and so we saw .NET boldly go cross-browser, cross-platform - at least, in CTP form. Loosely, the following year’s theme was (loosely) connected things: their impact on the individual, their impact on the organization. “Small pieces, loosely joined” was I believe how Ray put it. And then there were Rich Internet Applications. Silverlight 2.0, the highly anticipated enabler, went Beta. Designers (I thought) were finally somewhat understood, even if their Microsoft toolset was still fermenting. There was an explicit expectation set by Ray, Steve and Company that MIX08 represented but one of several steps on the road to something big at the PDC coming in the autumn. Then, months later, Silverlight 2.0 was unleashed on the wild, with 3.0 already on the horizon. But wait… were we even talking about the presentation layer any more, or, with Silverlight’s eventual impact firmly impressed upon us, had we moved on to discuss awesome sky-plumbing instead? 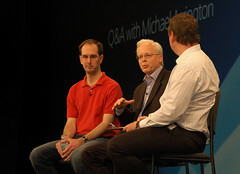 We’re talkin’ Azure, Live Services too numerous to mention, data and enterprise service buses and meshes in the sky, a bookstore that got there first, Models and Domain-Specific Languages (see Don Box’s characterization of this dreadfully wond’rous craic), and so much more, all available streamed online now for your viewing pleasure. So we begin MIX09 with feet tentatively on the presentation layer, but eyes on this intriguing Cloud on the horizon. 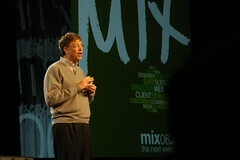 I mentioned previously that I visit MIX for the buzz. This week I’m there again to meet, to chat, and to think — and specifically, to ask what should we do with all this stuff? What could I do for my clients? For their organizations? For my own projects? Even if you’re not able to attend, the keynote will be streamed live, and you’ll have a chance to ask ScottGu some questions online 30 minutes after it’s over. We’re three years into this MIX journey to The Next Web. This week, we expect to gain insight into Microsoft’s perspective on the road ahead. I’m going to try to write here daily, and figure out how to use this Twitter thing as well. Inspired by keynote speaker Bill Buxton, I may even try my hand at a little sketching, and change up my technology choices as an audience member for the keynote and sessions. (hint: thinking of leaving the laptop behind). Right - that’s enough context - I’m off to Vegas to Mix things up a little! This blog post was originally posted at http://robburke.net/2009/03/16/a-brief-history-of-mix-feet-on-ground-eyes-on-cloud/.